This post is the third in a weekly series that will highlight things that you need to know about new features in BizTalk Server 2013. 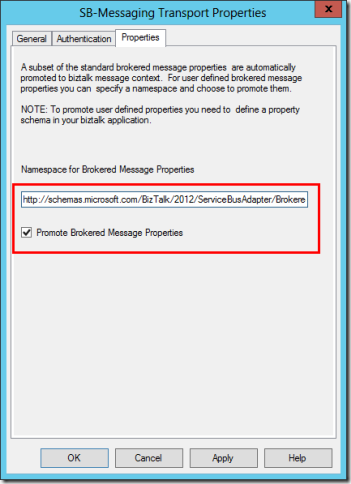 One of the major new features of BizTalk Server 2013, is the native ability to integrate with Windows Azure Service Bus through the new SB-Messaging adapter. This week we will be covering what can happen if you’re trying to integrate with applications that are loading up your Windows Azure Service Bus Queues with Brokered Messages made purely of properties. Context properties are not a foreign concept to BizTalk developers. Indeed, BizTalk messages themselves are made up of both a message context and body parts. The same is true to some extent of Service Bus Brokered Messages – though the implementation differs greatly. One major difference between the properties of a Brokered Message and the context properties of a BizTalk message, is that BizTalk message context properties have a namespace to disambiguate properties that share the same name. 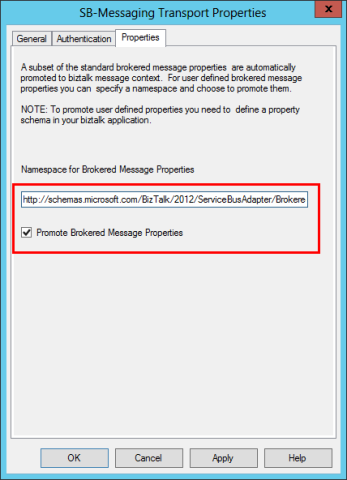 Brokered messages have no such thing, and no concept of a property schema for that matter (which allows BizTalk to have an awareness of all possible properties that can exist in the context). All of this will function pretty perfectly – assuming that the message sent to the Queue has a body. At last year’s TechEd NA conference in Orlando, one of the presenters (I believe it was Clemens Vasters) was discussing what Brokered Messages were, and how they were exchanged. In the talk, he mentioned that it was perfectly fine, and even preferable in some cases, to create a Brokered Message that was purely properties without any body content. Certainly this was a light-weight operation that relied only on HTTP headers, and required no overhead for serialization of body content. And at the time, I accepted this, and was happy. “There was a failure executing the receive pipeline: ‘Microsoft.BizTalk.DefaultPipelines.PassThruReceive, Microsoft.BizTalk.DefaultPipelines, Version=3.0.1.0, Culture=neutral, PublicKeyToken=31bf3856ad364e35” Source: “Pipeline” Receive Port: “WontMatchWhatYouHaveAnyway” URI: “sb://namespacehere-ns.servicebus.windows.net/somequeuenamehere” Reason: The Messaging Engine encountered an error whlie reading the message stream. If you came to this article because this error message appeared, and you’re not trying to receive an empty message from Azure Service Bus, just head right back to the Bing results page, and check the next result. Everyone else, stick with me. Let’s take a step back for a second. BizTalk Server 2013 is designed for integration between systems. I typically should not be adjusting my behavior outside of BizTalk to work with BizTalk. So here I want to take the same approach. What are our options here? Well clearly we have a failure in the pipeline while processing an entirely empty message body, which doesn’t allow us to get the point where we are processing a map. That removes our ability to use the excellent ContextAccessor functoid to pull the properties into the body of the message upon receipt. Instead we are left with building a custom solution. What is this custom solution I speak of? For now, I’m calling it the PropertyMessageDecoder pipeline component. 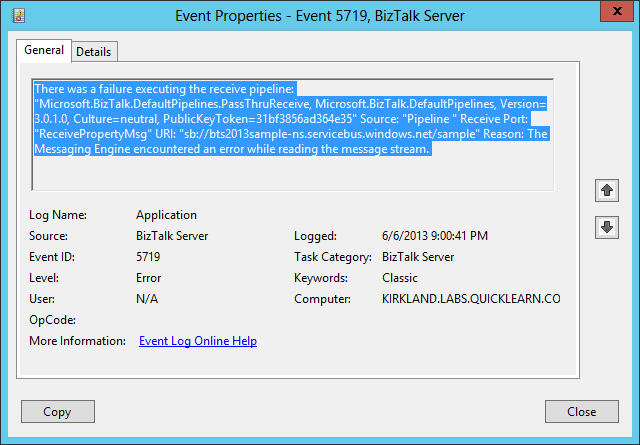 It is a custom pipeline component that creates a message body based on the context properties of a BizTalk message. If you already have a message body, this pipeline component will not help you, since it blindly overwrites the body if one exists. Instead, this is a purpose-built pipeline component for the specific scenario addressed by this blog post. I started development of this component by using Martijn Hoogendoorn’s BizTalk Server Pipeline Component Wizard. Unfortunately, it hasn’t yet been updated to work with BizTalk Server 2013, so I had to first create/upload a patch for BizTalk 2013. Once I was able to create a custom pipeline component project, I created a simple pipeline component that took the input message, and dumped the context properties into the message bodies. I also included some configurable properties that allowed one to opt-out of properties from the BizTalk system properties namespace, or to filter out all properties except those from a specific namespace (especially helpful in this scenario). 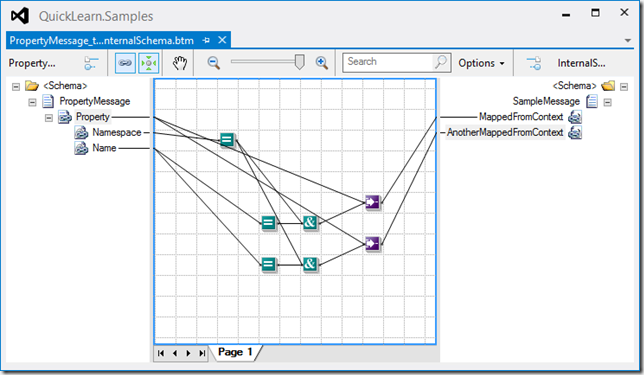 When included in a pipeline alongside the XML disassembler component, we are finally able to take those pesky “empty” messages from Azure Service Bus and process them as XML documents. The message context properties are still retained in the context for routing, but our custom properties are also made available for use directly in maps (through the liberal use of Value Mapping (Flattening) and Logical functoids), and further processing. Essentially we’re looping through the properties from the context (hence using the Value mapping flattening functoid) and only mapping the value stored inside the Property node whenever the namespace and name of the property match those that we care about. Since the namespace for all of our custom properties is the same, we have a single Equals functoid that we’re sharing across all (two) properties. Remember, that none of this stuff is necessary if you’re working with Brokered Messages that have a message body. You only need to go this deep when you’re dealing with Brokered Messages made purely of properties (which is a recommended practice when possible). By bringing out-of-the-box first class support for Windows Azure Service Bus Queues, BizTalk Server 2013 continues to prove that with a solid and extensible architecture in place, any type of integration can be made possible. 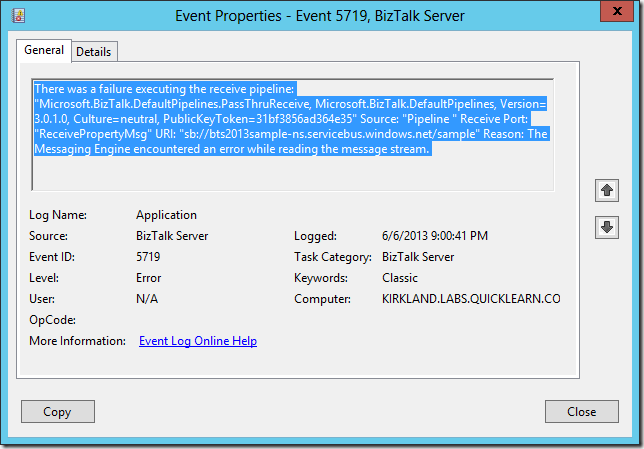 If you would like to learn more about extending BizTalk Server 2013 to meet your integration challenges, check out one of our upcoming BizTalk 2013 Developer Deep Dive classes.